Hello everyone: I have a card to share with you today made with one cute but sadly retired SU set called "Snow Much Fun". The little snowmen are so adorable and will definitely warm your heart. Here is my card, which I'm linking to the LiveLoveCards "Snow Flake" challenge, (I'm pushing the envelope here a bit with my Snowman card, I mean.....Snowmen are made of snow flakes, right?) and also, to the Mojo Monday sketch challenge, this is my second card for it. As always, I stamped the image with Stazon Jet Black ink onto a panel of Canson water color paper and colored it with the aqua painter and Stampin Up! markers in this colors: Pumpkin Pie, Cherry Cobbler, Real Red, Bashful Blue and Basic Black, I put a bit of gold gel pen on the hat, scarf and buttons, this is a very elegant Snowman, no coal buttons for him, tee hee!! the pattern paper and card stock are from Hobby Lobby, the gold ribbon from the bottomless ribbon drawer, I'm not buying any more ribbon, I don't think I will ever use all I have. The little golden bell is die cut with a sleigh bell die, possibly from Memory Box, not sure, it's old. The brad is from SU, very old too. I tied a little bit of gold satin embroidery floss on it. This is the sketch from Mojo Monday that inspired this card. I hope you like it, I want to thank you for stopping by, have a great weekend. Hello everyone: I have another card to share with you that I'm linking to the Pals Paper Arts color challenge and the Freshly Made Sketches sketch challenge , here is my card. This image is from the 2011-2012 Stampin Up! Idea Book and Catalog "Faith in Nature" stamp set, I just love the 3 images on it. I decided to stamp the Pear image onto a panel of Canson water color paper with Versa Mark ink and heat emboss it with Crush Curry embossing powder then, I color it with a bit of my Calypso Coral, Chocolate Chip and Old Olive markers and the aqua painter, then I stamped a couple of little leafs from the Altenew Persian Motifs stamp set, just because they look a lot like the leaf on this pretty pear. I die cut the image first nesting 2 of the dies to create the small and larger die cut then, I did the same with the Chocolate Chip card stock to create the frame around the image with Spellbinders scalloped circle dies and put them back on the panel like puzzle pieces. I stamped the "Hello" sentiment with Calypso Coral ink and heat embossed it with clear powder, the strip of Calypso Coral is punched with the retired SU Dotted Scalloped Ribbon Border Punch. Here is a close up of how pretty the embossing came out. This are the banners that inspired this card. Thank you so much for stopping by and for your comments. 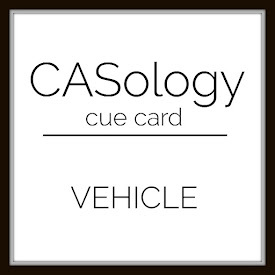 Hello Everyone: This is Cue Card week at CASology and the Cue Card is VEHICLE, whether 2 or 3 or 4+ wheels, find some kind of Vehicle image and come to play. Here is my card. This super cute little Moped image is from the 2011 SU Summer Mini catalog, this sweet set comes with another beautiful image and two sentiments. I stamped the image onto a panel of Canson water color paper with Stazon Jet Black ink and colored it with the aqua painter and these SU write markers: Pacific Point, More Mustard, Pumpkin Pie, Cajun Craze, Old Olive, Wild Wasabi and Basic Black. I added a bit of my silver gel pen to the wire basket, the wheels and handle. I just love this image, it just makes me wish to have one of this cute little vehicles. Thank you so much for visiting, until next time, happy stamping. Hello everyone: One of the most wonderful things about this craft is the amazing ways to learn from other card makers who share their experience and talent so selflessly and so kindly with the world. I do not consider myself an expert by any means but I do love coloring and making my cards for my family and friends but now, I have my little blog so I have a chance to share them with more card makers around the world. There is an enormous amount of talent out there in all areas of this craft and I've been so fortunate to come across some of the best. Here is the card I made for the Mojo Monday Sketch challenge this week, I will tell you where I got my inspiration from just ahead. Ok, this card was inspired by THIS card by Marika Rahtu, her incredible ability to blend colors and give shape to flowers with just the stroke of her pencils or Copic markers is something that I love and admire. I stamped this image from the Altenew set called Golden Garden , I actually won this set at an Altenew blog hop, lucky me!!! I stamped the image onto a panel of Ninah Solar White with Memento Tuxedo Black ink and I colored it with my Prismacolor pencils but I didn't use any baby oil this time, I just blended the colors and created shades by pressing a bit harder at the base and just lightly flicking the pencil upwards, like when you do a check mark. The beautiful blue and gold paper is actually from an Origami kit I bought at the bargain bin at Hobby Lobby some time ago, it has the most gorgeous papers cut into 4x4" pieces. I picked the colors for the flower from the colors of this paper, I love the specks of gold and the shades of blue and violet blue in it. The gold trim and butterfly are from little scraps I found, I'm totally running out of gold paper, need to get me some!! Here is a close up of my flower and this beautiful paper. This card is going to a dear Triathlon friend who is going to have hip replacement surgery in a couple of weeks, she is so scared that she might never run or ride her bike again, let alone race but I know she will, I told her this is just a bump in the road and besides, Triathlon racing season is over so she has a whole year to get back and race again. Well, I hope you like this card, I love reading your comments and if you have any questions, do not hesitate to ask. 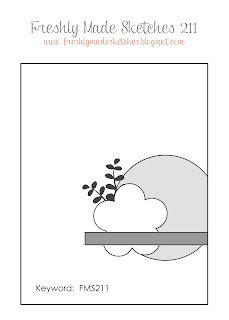 Here is the sketch that, along with Marika, inspired this card. Hello Everyone: The Retro Rubber Challenge blog has a easy sketch for us to play with, I encourage you guys to participate, the only requirement is that you use stamps that are at least one year old, and we all know we have a bunch of those beautiful stamp sets that have been retired but we just can't get rid of, I think I have more retire sets from all over the place than new ones. So, I hope you guys give this challenge a try, go and dig up your old, beautiful and forgotten sets and give them a chance to shine again. Here is my card. This card is made with one of the cutest, prettiest, most adorable Stampin Up! sets called "Holiday Home", it's so sad they retired it, I honestly do not understand why they do that. This set has 3 super cute little houses and a lot of other little stamps for every Holiday season, from Halloween to Christmas and everything in between. I stamped the house onto a piece of Canson water color paper and colored with my PRISMACOLOR PENCILS and paper stumps dipped in baby oil, then I snipped it out and glued it on a Ninah Solar White panel. Using my MISTI , I positioned the lamp post, Christmas Tree and snow man precisely where I wanted and stamped them with Memento Tuxedo Black ink for the lamp post and snow man and with my SU marker in Garden Green for the Tree. I sponged some Broken China distress ink for the sky and masked the moon then, I stamped the sweet, little Santa's Sleigh and adorable Reindeer with Memento Tuxedo Black ink, to follow the sketch, I die cut 3 little snow flakes with one of the small images from THIS Impression Obsession Snow Flake dies. The little stars in the sky are the inside of the snow flakes. I want to thank you for stopping by, thank you also for your comments, they always make my day. If you have any questions, please do not hesitate to ask. Hello everyone: Well, November is finally here!! It's the start of the Holiday Season and I love it!!! 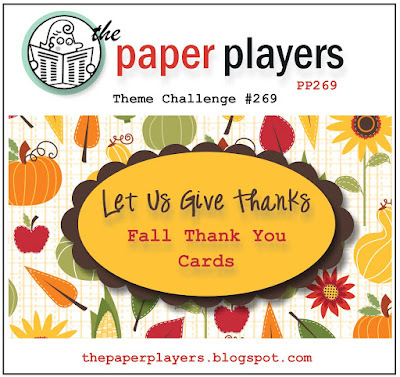 So, I made a card for The Paper Players "Let Us Give Thanks" Fall Thank You cards challenge. I love the colors of this Season, all so warm and gorgeous, here is my card. This beautiful image is from Power Poppy's So Grateful stamp set, I love this old chair with this beautiful pumpkin vase holding those pretty Fall flowers. My dear friend Patti Willey sent me this images for me to try, we often do this with some of our stamp sets. She stamped this beautiful chair and pumpkin onto a panel of Canson water color paper with Stazon Jet Black ink and I colored it with the aqua painter and my Stampin Up! markers in Chocolate Chip, Pumpkin Pie, More Mustard, Olive Green, Perfect Plum, Elegant Eggplant and Cherry Cobbler. I sponged a bit of Wild Wasabi at the bottom and a bit of Tim Holtz Broken China for the sky. The panel behind this image is made using the Paper Napkin Transfer Technique , this technique is super easy to do, the results are amazing, the texture of the panel feels like fabric, so pretty. With all the beautiful Holiday napkins out there this time of the year, or at any other time, the sky is the limit, I hope you guys give it a try. I stamped the sentiment with Hello Honey and die cut it using a set of dies from (not totally sure about this) Spellbinders, but I could be wrong. The linen thread is from my stash. I want to thank you for stopping by, I love reading your comments and I'm so grateful for you leaving me your thoughts, and if you have any questions, please ask me.